I want to say thank you to the Queen for having her guest design on her blog she absolutely LOVED it, and I love that people recognize how important it is to encourage our kids to be creative! Everything she did was her idea and she did most of it, I did help her wrap the paper around her project but other than that everything was her! I will have blog candy I'm just not sure what yet.....so leave a comment for Lily and we will get you entered.....if your not coming from the The Scrapbooking Queen please visit her as well for a second chance to win !!! Thank you sooo much for stopping by! Spirit day at school !! 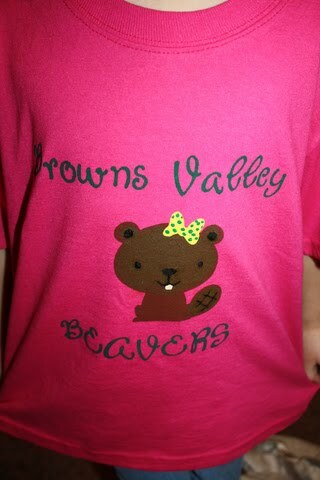 So new ones were made in pink with green and gold accents...perfect for a little girl. One of my friends came over and made one for her daughter then also made some cute corker bows in pink, green and gold ...because a girl has to have matching accessories. They were so excited to be twins today and rock it Kindergarten style! If your interested in any kinds of bows Katie does a BEAUTIFUL job they are huge, my girls LOVE them, she sells them via facebook and hopefully a site soon..click HERE to see them. I used vinyl on my Yudu instead of the emulsion process which is easier and cheaper! So I used cartridges Create a Critter, Lyrical Letters and Mickey and Friends. Action Wobbles in action on my PK challenge card! The PK challenge was a sketch and monochromatic challenge. I used Peachy Keen Critter faces and the Simply Charmed Cricut cartridge! This says "Welcome to the Neighborhood" inside! A fun Peachy Keen face ...what else? Im sooo excited !!! Jinger and PC picked my card as one of the winners for the HSN/ Anna Griffin challenge. Thank you to everyone who supports me via facebook and my blog I truly appreciate it! I will definelty post some creations when I get my prizes !!! Hi Everyone! 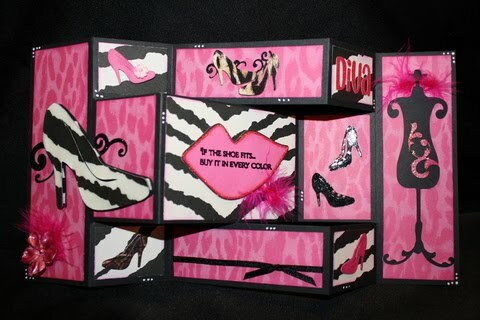 This card was made for the HSN/Jinger/ Anna Griffin card challenge and the Pink by Design DT entry. For the challenge we had to use certain carts and an Anna Griffin product. The carts used are Wall Decor and More and Don Juan. ALL patterened paper is Anna Griffin. For the DT entry it needed to have a stamped sentiment this is from Shopaholic by Pink by Design. Enjoy~ And fingers crossed my card makes it to PC in time !!!!! Here's a quick card I made last night with the Pack your Bags Cricut cartridge. 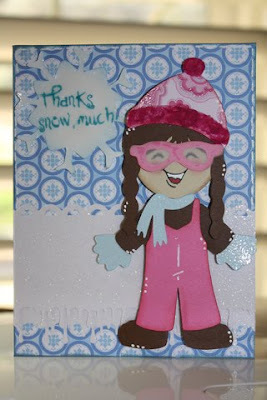 I used a Peachy Keen Laughy Taffy face stamp and a Pink by Design sentiment from Shopaholic. Thank You to all who follow my blog and my work, I appreciate everyone !!! All winners were chosen by random org. So lets get to the winners !!!!! - 48 sheets of glitter cardstock, mat stack size ( it says Christmas but I use it for everything else cuts great in the cricut!) winner is ........ 4kids4 Sharon C.
This is a treat holder, untie the ribbon and it will reveal the treats inside !!! No Cricut was used on this because it needs to showcase a stamp. I do plan on making Valentine one's for my Blog hop on Saturday February 5th I will have a video showing you how to make your own! This week at the FCCB the challenge is to create something with winter clothing on it. This card I used the Everyday Paper Dolls and Pooh and Friends cartridges. I also used a fiskars and Martha Stewart punch, glossy accents, Peachy Keen Happy Lashes face stamps and for the first time ever I used crushed velvet on the hat !!! Want to join in the challenge? 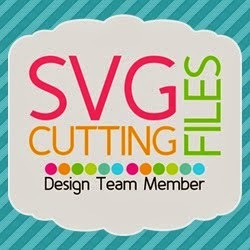 Head on over to the Fantabulous Cricut Challenge Blog to upload your project! 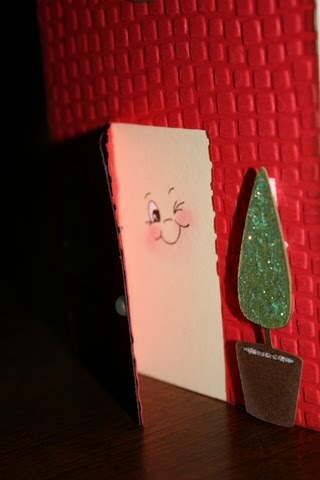 * This card is also for the Peachy Keen challenge of a thank you card. Did you hear this site has over 1000 followers now???? I cant believe it either! In honor of that Im doing a giveaway for 5 people. Just scroll down to the next post to enter! First I want to say THANK YOU from the bottom of my heart. I cant believe when I started this blog back in April I would have 1000+ people like my work in this short amount of time. Ive always loved to do crafting and received my Cricut from my hubby when they first came out (he had no clue what he started ....LOL) SO again many thanks to all my current and new followers also the friends Ive met and who have supported me via facebook !! 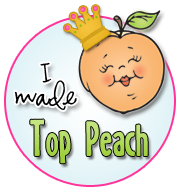 Also to all my new friends who take my Cricut classes..........lol listen to me you would think I won an oscar...lol..but seriously THANK YOU!! So I want to give out 5 prizes, all you have to do is leave a comment and YES you do have to be a follower because that's what this celebration is all about !!! So just leave me a comment and I will keep this open till Thurs Jan 13 th the winner will be posted on Friday the 14th !!! Thank You again soooooo much ! WINNERS from BOTH blog hops !!!! and the winner from that hop is..................... Rhonda Emery she wins a fiskars fingertip knife! and the winner from that hop is..................Bevy48 she wins a letter size pack of dark brown cardstock !! winners please email me at michelle@scrappinwithmybug.com Also I will be holding another Cricut 101 class on FEB. 12 in the yuba/sutter area in No. California if interested please email me as well. Hi Everyone! I wanted to share my card for the My Pink Stamper design team submission. 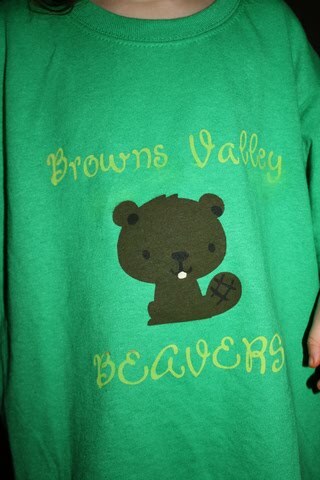 The submission needed to incorporate Robyn's 3 favorite colors: brown, green and of course pink ! So I tried to stay very true to just those colors!!! First I wanted to incorporate My Pink Stamper stamps. I used two different stamps on her punny-licious set to create my own saying. DCWV patterned cardstock from the "Sweet" stack.